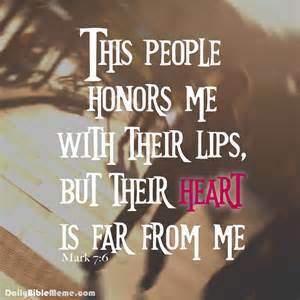 ‘This people honor me with their lips, but their heart is far from me. “Whenever you pray, do not be like the hypocrites, because they love to pray while standing in synagogues and on street corners so that people can see them. Truly, I say to you, they have their reward. Hypocrite is a very harsh word. It condemns those who are such. However, it is a truth to be told. It is unfortunate that there are hypocrites among us. They are persons that we see and talk to in our everyday life. They go around preaching to others with empty words, heartless words, as their backing is not Christianity but personal gain and public recognition. They wish to be seen as devoted Christians, when truly, they are not. They stand among the many shouting loud words so those surrounding them can hear them. They embellish their speech as to appear godly. It is not the words spoken that profess our love for God, but our daily actions that express it. Our lips can move and say enough words to let others think we are with God, but truth be told, our heart, our intentions, and our sincerity is seen, heard, and felt by God, without the need for words. Our hearts hold our true belief, thoughts, and knowledge. It bears our souls, our burdens, and our conviction. A heart for God resides in each of us that is saved. It holds the Holy Spirit that guides us each day. A sincere and pure heart will seek God’s approval, not man’s approval. It recognizes that it is better to be good with God, than good with the world. It understands that to be accepted by God leads to our eternal salvation. Whereas to be accepted by man leads to earthly desires and preoccupations. Because our heart is the bearer of our soul, God can hear it. He can hear its sincerity. He can discern what it says from what it means. He cannot be fooled by empty spoken words. When we speak aloud about our intentions, God sees our true nature. He knows that what we are saying may or may not be the truth intended. Whereas we can fool man with words, God sees what we really are capable of or what we really mean. Our intentions are clear to Him. There is no way to hide them. We need not waste our words by speaking beautifully in front of a crowd when there is no love in our heart, nor meaning in our words. We need to act the way we intend to and let others see that our life speaks for us. It doesn’t matter what we say, God knows our sincerity. It is not the words expressed but the meaning behind each. Because God lives in us through the Holy Spirit, he can feel our sincerity. He knows when we are truthful and when we are not. He knows when we are sincere and when we are not. He can feel what we are trying to convey, and what we are trying to portray. He sees past the window of our soul and reaches to our true reflection of who we are. He is in us. He lives in us. He is with us. Categories: devotions | Tags: belief, Bible, Biblical inspiration, born of spirit, Christ, christianity, devotion, devotional, make time for God, todays verse, word of god | Permalink. Merry Christmas to you. Enjoy this beautiful season. Thoroughly enjoyed reading this. Merry Christmas!